Finally after much back & forth discussions the U.N.
U.S. State Department is calling this a "historic step". strong at criticism of South Africa by some nations. This is a great day for our global LGBT Community. 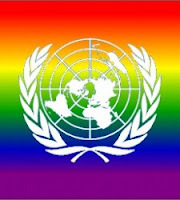 It really is a key part in setting a new norm that gay rights are human rights and that that has to be accepted globally. It talks about the violence and discrimination that people of LGBT persuasion experience around the world and that those issues ... need to be taken seriously. It calls for reporting on what's going on, where people are being discriminated against, the violence that is taking place, and it really puts the issue squarely on the U.N.'s agenda going forward.